Welcome to our FAQ section. This page might be helpful if you haven’t been able to find the information you needed on our website. We hope these FAQ about Peru have been helpful. Wear valuable items discretely; don’t carry large sums of cash and watch your bags and luggage. Always carry your driver’s license, a copy of your passport and the rental agreement if you’re driving a rental car. International driver’s licenses are valid for one year, while driver’s licenses from other countries are valid for 30 days. In Peru we believe in the idea of “Tourism for Everybody”. This is why many public and private organizations have been working for years to ensure that their services are equally accessible for the differently-abled. What’s the weather like throughout the year? Each web page has a specific list of what to bring for your trek and the list supplied here might not apply to you. However, remember that the weather in the Andes can be very unpredictable and you should be prepared for bad weather. Peru is located in the southern hemisphere meaning the winter extends from June to August. In the summer months daytime temperatures can be hot & sunny, but the nights can be very cold. During winter it can be cold and rainy during the day and particularly cold at night. 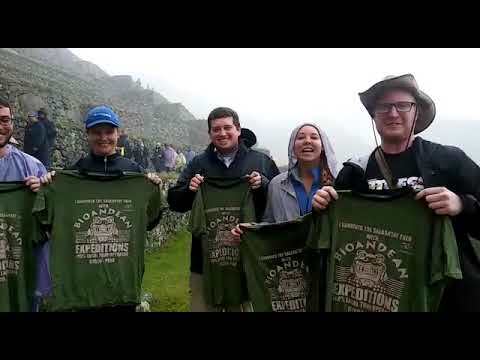 It is usual to encounter some rain all year round so we recommend buying a cheap poncho in Cusco for about US $1. We also recommend bringing thermal underwear in order to combat the cold. It’s recommended to wear the thermal underwear in the evening and early morning. When packing try to bring a range of layers so that you can take off or add clothes as required in the ever changing Andean weather. Rain gear (jacket and pants if available) or rain poncho. Plastic ponchos can be bought for about $1 in Cusco. Non-disposable canteen (Nalgene type) and water for the first morning. We advise you to bring water sterilizing tablets in case you collect water from streams. Your own medical kit with any special medications that you might require, paracetamol etc. Cash – sufficient for your final meal in Aguas Calientes, tips and souvenirs. Please see each page for specific notes in regard to the equipment that is carried on each tour. Generally, the following items are ‘normal’ unless specified on the tour page. Tents – 2 people in a 4 person tent which allows for greater comfort, and also storage of backpacks. All tents were purchased in 08-10. If you are travelling alone and would like your own tent, please request this. Normally we can accomodate single travellers in a 2 man tent. If you are travelling in a group of 3 we might accomodate you in two tents or a 5-6 man tent. Basic foam mattress. If you require greater comfort during the trek we can hire you an inflatable mattress (eg. Thermarest) for $5 per day. Cook and Cooking equipment is included. We hire sleeping bags (rated for -5, -10 and -15 celsius temperatures) , thermarest (inflatable mattresses), walking poles, and extra horses for luggage. Which sleeping bag to choose? Do you feel the cold – then opt for the -15 bag. Our foam mattresses (included in the price) are more than adequate but a thermarest inflatable mattress provides a lot more luxury! Walking poles – guides advise that two poles are better than just one as they provide much more balance, especially on steep descents (ie Llactapata on the Salkantay route and the Choquequirao and Choquequirao to Machu Picchu sections.) Please check our booking form for current prices. Super Sleeping Bag suitable for -10deg. Walking stick lightweight aluminum – Two sticks are recommended for tough hikes to aid balance. Extra mule to carry YOUR things for alternative treks. This mule is if you think you will exceed the luggage allowance of 8kg. Extra riding mule and muleteer to lead it . Included in the price of your trek is an emergency horse. If for some reason you think that you will need a horse for more than simply emergencies, then its advisable to have a personal horse. (ie for older people or younger people. Some parents like to have a horse for their children) However a horse cannot be used in all circumstances so you need to be fit. Extra porter to carry your things – for the Inca trail treks only – if you think that you will exceed the luggage allowance of 7kg. During the trek we advise you to store your main luggage at your hotel in Cusco- all hotels or hostals should provide you with luggage storage as a courtesy service. At your briefing you will be loaned a small duffel bag to pack clothes for the trip. Please limit your luggage in this duffel bag to 8kg (15lbs) each person. The mules will carry these bags together with the food and equipment for the trail. The duffel bags are waterproof but it is still advisable to put your things inside a plastic bag within the duffel bag. The approximate dimensions are 60cm by 30cm. PLEASE RETURN YOUR DUFFEL BAG AT THE END OF THE TRIP!!! You can do this by leaving it in the reception of your hotel. We have continued to “lose” the duffel bags so please be consciencious and return your bag! Most people carry their own day pack with up to 5kg of their things – a change of clothes and wet weather gear etc. However, if you think that you will have much luggage and you want a very light day pack (eg. just camera, sunscreen and water) then its advisable that you hire an extra mule. Please note that you will not have access to these items until the end of each day as the muleteers travel at a different pace than the group. Your sleeping bag is always included in your duffel bag, so allow approx 2 kg of weight. This still gives you 5kg of things, which is more than adequate for a hike of several days. (b) Pay a “fee” of $1 per 1kg per day of the trek. At the end of your trip, please leave your duffel bag in the reception of your hotel. We will come to collect it. We send an “emergency” horse or mule on your trips which is to be used in case of emergency, sprained ankle or even if you have been sick and feel weak. If you are walking particularly slowly, your guide may advise you to use the horse so that the group reaches their campsite in good time. PLEASE USE THE HORSE IF THE GUIDE SUGGESTS IT! It is in the best interest of everyone in your group that you all arrive at your campsite in good time. Please also note that this is not a “horse” as considered by Western standards, it is more like a cross between a mule and a horse and it will not be comfortable to ride for long periods of time. If you seriously think you require a “riding horse” please discuss it with us. It should also be noted that in extremely wet, muddy or steep conditions that sometimes it is inadvisable to ride the horse for safety reasons. see here for a picture of the a riding horse. Note: an emergency mule is not included on some treks, (specifically the Classic Inca Trail) so you should carefully check your list of inclusions for specific information. Do you need an extra luggage mule/or riding mule? We include in the price of your tour 8kg (15lbs) of luggage each person. We LOAN you a duffel bag which you can put this 8kg in. The reason for this is that duffel bags strap onto mules much better than backpacks/your luggage and its better that our custom designed duffels get dirty than your luggage (also if your backpack has a fancy harness then it can get damaged on the mules). If you think that you are going to need more than 7kg (plus the things that you carry in your day pack) then you might like to consider hiring an extra mule. Each mule can carry about 20kg of equipment so its usually shared between 2 or 3 people. Most people find that 7kg is more than adequate if they pack normally or a little conservatively. We strongly recommend that you leave the bulk at of your luggage at your hotel in Cusco – all hotels or hostals should provide you with luggage storage as a courtesy service. Included in the price of your tour is 1 emergency riding horse. If you have in your group younger children, or older people, people who are not very fit, or people who have never hiked in the mountains before, you might consider paying for an extra mule. This is especially if you think that someone in your group will utilize the horse a lot! if you wish to order an extra porter (Inca Trail Only) it MUST be done at the time of booking or permits will be sold out. if you wish to order an extra riding horse or an extra cargo horse it can only be done as late as one week prior to your departure as the muleteers live in remote areas and are not easy to contact about the number of mules they need to bring to the trailhead. Private tour supplement (if only two passengers). if you want a private trek (only 2 passengers) then you need to pay the 2 person price plus a $150 dollars private trek price per person. If choose to list the trek on trekkers wanted, but no one joins the trek, then you will not need to pay this fee. Passport name/number change fee. $20 per change. this applies to inca trail reservations. as permits are hard to obtain, sometimes people need to make their reservations using an old passport, but will be travelling with a new passport. We make the change when you have the new passport, and we strongly suggest you travel with both passports. Change fee. $20 per change. this applies to date changes, and other changes not specified but will require administration staff time! • Train changes are explained below. For backpacker trains the timetable is 2.30pm and 6pm, and you return to Cusco approximately 4-5 hours later. A representative of the agency will meet the train in Ollantaytambo and transfer you back to your hotel in Cusco. We apologise in advance if we cannot get either of these times, if we cannot we have endeavored to do so. Some people want early trains, some people like later trains, and its impossible to anticipate people’s preference. Please also note that in high season (normally July-August) the trains to Machu Picchu and back again are completely over-subscribed and its difficult to get tickets, even with several weeks notice. (this is why we are inistent that you send your passport details asap!) In the case that Bioandean Expeditions is not able to obtain train tickets for you we will provide a car that returns via the Abra de Malaga to Cusco. (approx 6 hours of travelling). If you have specific travel plans that might be affected by the Peru Rail timetable, you should advise us AT BOOKING. You cannot advise us at your pre trek briefing, this is too late! We can only make a change to a train ticket ONCE. If you decide to come back at a different time than the rest (majority) of your group, then your transfer from Piscacucho or Ollantaytambo is NOT included in the price of your tour. You will need to pay this yourself. The cheapest & simplest way of changing your train ticket is to wait until the day you arrive in Aguas Calientes, and go personally, with your guide, and try to change it on the spot, paying only the 10% relocation fee. We generally recommend that you start out from Cusco with 1-2 litres of water. You should also bring a refillable water bottle with you. (Any bottle you buy from the shop will do but we recommend a hardy plastic bottle) During the day, when you are hiking you can fill up from streams, on the advice of your guide. You should use purification tablets for this water. (Micropur tablets can be bought in Cusco or you might like to ask in your camping shop at home. Some people recommend iodine tablets). In the evening, your cook will boil water for your use and you can fill up your bottles every morning before setting out. As people have different requirements for water (ie some people drink a lot and others less) it is important that you take responsibility for ensuring you have enough water each day. You need to communicate your needs (via the guide) to the cook. Our cooks serve hygenically prepared food that features Peruvian and Western dishes. If you are a vegetarian or have specially dietary requirements and/or allergies, please specify on your booking form and remind us at your briefing. Water is boiled for three minutes before being used for cooking and raw vegetables, if served, are washed in boiled/ purified water. There are few opportunities for bathing on our treks. However, in the evening and morning, please ask your cook to warm some water for you to wash your hands and face. There are cold water shower facilities on the Salkantay and Choquequirao trek. Medical Kit Each trip departs with a basic medical kit and an oxygen bottle. We advise that if you have your own medications and needs that you bring these. We do not include altitude tablets in our kit. Please note that the blister care that we have is Peruvian style (band-aids and cotton wool) – we do not have second skin or Western style blister treatments. Each trip departs with a basic medical kit and an oxygen bottle. We advise that if you have your own medications and needs that you bring these. We do not include altitude tablets in our kit. Please note that the blister care that we have is Peruvian style (band-aids and cotton wool) – we do not have second skin or Western style blister treatments. Please review what is included in your trek in order to estimate what you should take. Along the way you can buy snacks and souvenirs, mostly of a non expensive nature. (Though if you decide you want to drink a lot of PowerAde, it does add up!) Most people also like to enjoy a nice meal and some drinks in Aguas Calientes on the night you arrive from your trek. Aguas Calientes is generally more expensive than other parts of Peru, so expect things to cost more there. Finally, bring money to tip your staff and your guides. (Please see below) There is an ATM in Aguas Calientes, but don’t rely on it working so we suggest you take ample to cover your expenses while there. Tips vary and depend on the traveller’s satisfaction with the quality of the service rendered. Although our staff are paid just above local industry rates, and we include all meals and transportation, they do appreciate tips. Tips also provide incentive for staff to work harder. Deciding how much to tip the porters, the cook and guide is a difficult moment at the end of the trek and can be made more difficult when members of the group have different cultural understandings about tipping. (Some countries tip, other countries don´t tend to tip). Generally speaking, if the group have been pleased with the service then try to ensure that (minimum) each porter/muleteer takes home an extra 20-30 soles per day of trek, cook 40-45 soles per day of trek, and the guide as you feel is appropriate. (these amounts are shared between all members of the group, and are not individual tips. if your trip is 9 days then the group as a whole would tip 10 soles x 9 days. Even if the muleteers were only with you for 2 days on the shorter treks, please calculate their tip based on your entire trip length. Ie the Expreso Salkantay is 4 days, and the muleteers will take at least 1 day to return home, even though they are not directly in your service). A recent, higher estimation follows: between $10 and $20 a day for guides, between $5 – $10 a day for cooks and drivers, and $3-5 a day for the muleteers. Again, that should be divided between everyone on your tour, is PER person, and multiplied by the full length of your tour. We believe that ultimately, tipping the guide and cook should be dependent on the quality of the service that you received. At no stage should you feel obliged to tip! Trekking in the Andes is generally pretty safe. There is minimal theft – it does sometimes occur on the more touristed routes (ie Salkantay). Be cautious, not paranoid! We do recommend always sleeping with your valuables (ie money belt, passports) near your heads or in your sleeping bag. Your camera and day packs should be kept between you or near your heads – never near the flap of your tent. Shoes should be stored inside!